It's such a great time to be collecting classical recordings. And, no – I'm not about to launch into a rant about whether CDs are better than well-produced and -preserved LPs (they're not, OK?). Rather, my joy stems from the sheer abundance of historical releases that far outstrips anything known in the LP era. There's some dross to be sure, but loads of fabulous discoveries, both new and old. Take Hermann Abendroth (1883 – 1956). Until quite recently, he was virtually unknown. Most of the standard references either omit him altogether or relegate him to passing mention on a list of "other" conductors of his time. (At least he goes to the head of such lists when they're alphabetical.) But since the mid-1990s, his discography has exploded from nothing to dozens of CDs. The secret is now out: he just may have been the most underrated conductor of all. Like every great classical artist of his time, Abendroth was raised in the musical traditions of the late romantic era and was imbued with its ego-driven interpretative ideals. But by the time they came to record, nearly all of his peers fell under the influence of the modernists and abandoned their initial emotive outlook in favor of an objective approach that suppressed their creativity. Abendroth, though, was relatively immune from this transformation. His records are among the precious few that convey the nineteenth century ideal of the performer using the score as a mere starting point for his own deeply personal interpretation. The reason for this was largely a practical one: Abendroth's career was nestled in Nazi Germany, Russia and then East Germany when those countries were unwelcome sources for cultural imports to the free world. A benefit of this isolation was that he remained relatively untainted by the cosmopolitan influences that generalized the approach of most of his contemporaries, preserving instead the esthetic ideals of the earlier culture in which they had all been trained. An unfortunate drawback, though, was to ensure Abendroth's obscurity in America and most of Europe. It's tempting to draw comparisons between Abendroth and the legendary Wilhelm Furtwangler. Indeed, there are striking similarities: their births, deaths and careers coincided, they both became controversial figures by remaining in Germany during the Nazi era, and they both favored tempo extremes and were transported by impulse. Their approaches to structure, though, were quite different. Furtwangler agonized over careful preparation for transitions and blended his tempo changes to create an architecture of seamless logic even while it pulsed with tension and shifting emotion. Abendroth, though, tends to suddenly lurch forward when the mood is to change. Both take us to exotic places, but Furtwangler's ride is nestled in deep intellect while Abendroth's is one of white-knuckled whiplash. Furtwangler's art may provide more lasting satisfaction, but Abendroth's is impulsive and more immediately exciting. Those who revere Furtwangler as the greatest conductor on record are not about to readily admit another into his exclusive pantheon. Many of us have deeply personal memories of our first discovery of a Furtwangler performance that eclipsed everything we had ever heard before and irrevocably converted us to his unique genius. The recent spate of Abendroth CDs provides a chance to relive such moments. Here is another conductor whose personality provides a conduit into the aesthetic of the romantic era and who breathes essential life into the dry notations of the scores to recreate them in the way their composers intended. Of course, it's impossible to say whether such efforts are truly authentic, but they sound so "right." At the very least, the rediscovery of Abendroth's bold readings opens a door to new interpretive possibilities. Abendroth's few studio recordings (collected on Tahra 102 and 106-7) display his architectural vision and odd shifts of tempos, but the controlled setting seemed to inhibit much of his inspired improvisational energy that holds the greatest fascination today. 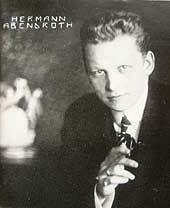 Fortunately for his posthumous reputation, beginning in 1949 Abendroth recorded dozens of major works for broadcast with the newly formed Leipzig Radio Symphony Orchestra. The arrangement provided the best of both worlds: the spontaneous excitement of a live, continuous performance, but without the awkward balances and distracting audience noises that often mar concert pickups. Together with surviving records of a few genuine concerts, they comprise Abendroth's true legacy. The modern appeal of these recordings lies in the degree to which Abendroth frees himself from convention and constantly teases our expectations in ways that shed a fascinating new light on familiar pieces. He's one of those rare conductors who always seems to have something to say that's different and challenging, yet eminently musical. Before considering the Abendroth recordings, I need to add a prefatory note. There are two primary series of Abendroth CDs: 22 volumes on the Italian Arlecchino label, and a dozen or so on French Tahra. (There's also a mid-priced series on Berlin Classics, a few sets on Music & Arts, and various copies from European dupers, which mostly duplicate the Arlecchinos.) Tahra prides itself on technical quality restorations from authorized original sources and has attacked the authenticity of Arlecchino's dates and attributions; indeed, there clearly are errors – one Arlecchino date is four months after Abendroth's death! Claiming no original research, for purposes of this survey I've accepted all the CDs as authentic in their entirety and I've cited the date and ensemble listed by the producer. The Tahras tend to sound better, but there's little duplication between the two series and since neither is generally available, your own selections may have to depend more on luck than conscious choice. I'd also note that Abendroth's performances of the same work tend to be quite similar, so (except as specifically noted) alternates to the versions I've cited should suffice. Brahms – We seem to have more of Abendroth's Brahms than of any other composer, and that's just fine, as he reveals an extraordinary affinity. Despite different eras, venues and orchestras, each of his performances reflect the same basic vision of fiery passion, clean sonority, sharp attacks and extreme tempos. Typical is the finale of the Symphony # 1, where the pulse drops to a crawl and then accelerates to a giddy speed. While some may dismiss this as immature impulse, I'll vaunt it as brilliant insight. I especially recommend his Brahms Symphony # 1 (Berlin Radio Symphony Orchestra [which I'll abbreviate "RSO" from now on] 1955, Tahra 145/146; or, in a rougher but equally compelling version with the Bavarian State O 1956, Tahra 141/142), Symphony # 3 (Berlin RSO 1956 – his second-to-last concert, Tahra 145/146), Symphony # 4 (Leipzig RSO 1952, Arl 127, more focussed than a Leipzig RSO 1950 on Music & Arts 1065) and German Requiem (Berlin RSO and Radio Choir 1952, Arl 92), all of which boast excellent recordings. A Symphony # 2 (Leipzig RSO 1952, Arl 127) injects tension by constantly chafing against its essentially pastoral essence. A Tragic Overture (Gewandhaus 1945, Arl 71) eschews inherent melodrama for mystical probity but is hampered by a lackluster recording. The Haydn Variations (Leipzig RSO 1952, Arl 71) has huge pauses between sections but, unlike Furtwangler's superficially similar approach, doesn't seek to exploit the interrelationships. A Violin Concerto with Oistrakh (Berlin RSO 1952, Tahra 145/146) fully reflects the soloist's impulse and vitality. A Double Concerto with Kirmse and Gunther (Leipzig RSO 1950, Tahra 145/146), is broadly conceived and patiently unfolded but with a muted deference, perhaps reflecting the soloists' more pedestrian contributions. Bruckner – After the fire of his best Brahms, Abendroth's Bruckner can seem a bit disappointing, despite the heavy critical praise lavished by others. Abendroth seems to opt for a middle ground of balance and moderation, lacking the tension of Furtwangler, the splendor of Celibidache or the huge emotional wallop of Horenstein. This approach works best in the Fifth (Leipzig RSO 1949, ARL 149) and Seventh (Berlin RSO 1956, Tahra 114) Symphonies, which are consistently superb throughout; both benefit from Abendroth's tidy, small-scaled approach – finely detailed, small-boned and modest – and boast particularly good recordings. His Fourth (Leipzig RSO 1951, ARL 107) has a wonderfully propulsive and improvisatory first movement, but, once having spent all his artistic energy, the rest is pretty standard. An Eighth (Leipzig RSO 1949, Tahra 115) is quite serious and somewhat perfunctory. His Ninth (Leipzig RSO 1951, Berlin Classics 0120 050) inhabits a world strikingly similar to Furtwangler's magnificent 1943 Berlin Philharmonic concert. While it may lack Furtwangler's astounding sense of manic urgency and driven intensity, Abendroth's trademark collisions among blocks of differing tempos, while annoying to some in other repertoire, seems undeniably appropriate here. Beethoven – The prize here is Abendroth's magnificent, full-blooded statement of the Symphony # 9 ("Choral"), one of his most stunning achievements, bursting with personality and unique expressive touches while exalting the structural flow. Abendroth enlivens the work with extraordinary attention to instrumental balances and rhythmic detail, but spiced with dynamic accents, tempo extremes and even an occasional snarl to remind us of its revolutionary nature, even transforming the grand theme of the finale, usually presented as a majestic hymn, into a wild, urgent plea. Of his extant recordings, a 1953 Leipzig RSO (Arl 150) is the most dramatic, a 1950 Berlin RSO (Tahra 230) is the best recorded, and a 1950 Leipzig RSO (Tahra 1065) is alive with insight. A set of 1939 Gewandhaus acetates of the finale (also on Tahra 1065) shows how little his fundamental conception changed over the years. (A 1951 Czech Philharmonic (Tahra 129) rises above its sonic challenges for an intriguing finale – it's sung in Czech!) 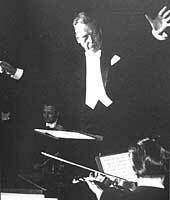 Also inspiring is Abendroth’s deeply distinctive Eroica (his first broadcast with the Leipzig RSO on January 24, 1949 – Music & Arts 1065; or a somewhat richer and more urgent 1954 reading with the Berlin RSO on Tahra 131). The first movement is alive with sharp insistent accents that constantly chafe against its steady deliberate pacing, followed by a teasingly attenuated funeral march, the two interpretive extremes setting up a finale of extraordinary tension between contrasting sections of repose and driven vigor. Symphonies 4 and 6 (both Leipzig RSO 1949, Arl 75) are conceived along more traditional lines, but include some surprises of their own – extreme tempo changes in the scherzo of the 4th and a vertiginous peasant dance and violent thunderstorm leading into an especially heartfelt finale in the "Pastorale." Abendroth undoubtedly worked wonders with the Fifth in concert, but (so far, at least) we only have a 1939 studio set with the Berlin Philharmonic (Tahra 102); it's strikingly similar to Furtwangler's 1938 Polydor 78s – strongly characterized and beautifully wrought, but perhaps ultimately just a bit reticent. For the Fourth Piano Concerto (Breslau 1939, Music & Arts 1065) Abendroth provides a deeply empathetic setting for Kempff's exquisite nuanced solo work (replete with a surprising number of gaffes, but redeemed by his own inventive cadenzas). The Violin Concerto with Oistrakh is nicely shaped with a strong rhythmic drive (Berlin RSO - 1952 on Tahra 130 or 1950 on Arl 164, but for the latter you'll have to endure an incredibly noisy and consumptive audience). Schubert – If you want a monochromatic, respectful, "classical" rendition of the Symphony # 9 ("Great"), there are dozens from which to choose. Abendroth's astoundingly fresh and daring vision (Berlin RSO 1955, Tahra 139/140) is alive with a unique and ardent passion. His extreme tempos, bizarre balances and deeply personal inflections are at first shocking but the details soon coalesce into a fascinating logic that overlays and immeasurably enriches the original structure. It's a stunning transformation that produces an overwhelming emotional effect that will leave you gasping. In the Symphony # 8 ("Unfinished") (Leipzig RSO 1950, Arl 176), Abendroth constantly teases our expectations by altering the interplay of tempo and dynamics to which we have become accustomed. He delineates the structure of the first movement through strong dynamic contrasts in lieu of the tempo variations upon which most conductors rely; then, having seasoned us to that scheme, he thwarts our anticipation by muting the first and third of the four normally monolithic climaxes in the second movement, not a mere shallow rhetorical device but a disarmingly simple and brilliant means of bolstering the formal design of the piece, which often can seem diffuse and repetitious. Finally, there's a Symphony # 3 (Gewandhaus 1945, Arl 192), which Abendroth deepens with weighty sonority and massive textures, but not at the expense of its fundamental youthfulness, which he preserves with a vigorous pulse, especially in the final two movements. Weber – The Overtures to Oberon (Bavarian State Orch 1956, Tahra 139/140) and Freischutz (Hungarian Philharmonic 1954, Arl 93) exemplify Abendroth's art in microcosm. The openings and lyric central passages constantly pull back in order to set up huge, explosive leaps into the overtly dramatic sections. Each packs an exhausting emotional range into a mere nine minutes. Mendelssohn – By contrast, Abendroth respects Mendelssohn's essential sweetness by moderating the climaxes and deliberately understating the latent power in the Hebrides (Leipzig RSO 1949, Tahra 139/140 or Arl 93) and Midsummer Night's Dream Overtures (Leipzig RSO 1950, Tahra 139/140). On a related note, there's also a Gluck Iphigenie en Aulide Overture (Berlin Philharmonic 1944, Tahra 139/140 or Arl 93) that's all suitably stylized grace and pomp. Richard Strauss – Don Juan (Leipzig RSO 1952, Tahra 138) is wonderfully bold, brash, curious, teasing and impulsive, a brilliant and entirely appropriate interpretation of the subject character's personality. Till Eulenspiegel (Leipzig RSO 1950, Tahra 138) and Death and Transfiguration (Leipzig RSO 1949, Tahra 138) are more conventional and somewhat restrained, but seem far less striking, so spoiled have we become by a field crowded with other fine recorded renditions. Johann Strauss, Jr. – As for the other Strauss, Abendroth leads waltzes and overtures with great verve and energy. His approach is fundamentally deep-hued and serious, yet full of vivacious zest. Partially overlapping collections with the Leipzig RSO in 1950 are on Tahra 141/142 and, in much weaker sound, on Arl A17. Wagner – The four Wagner pieces Abendroth recorded reveal him to have been fully responsive to their range of dramatic demands. A Meistersinger Overture (Bayreuth 1944, Arl 93), which continues into the opening chorus before fading out, is pure celebration and is hugely exciting, despite a shrill and compressed recording. A Faust Overture (Berlin Philharmonic 1944, Music & Arts 1065) is a rich blend of melancholy solitude and tempestuous yearning. Woton's Farewell, with Sandor Sved (Hungarian State Opera 1955, Arl 93) is deeply humanistic. The Wesendunk Leider, with Tiana Lemnitz (Leipzig RSO 1950, Arl 93) ooze with sensitivity and overall calm. Tchaikovsky – The standout here is a Symphony # 4 (Leipzig RSO 1951, Arl 64), where the focus is on the two inner movements rather than the overtly dramatic outer ones. Abendroth reconceives the center of the work in terms of unconventional pacing for each major section, while keeping the pulse steady within each block. Thus the Andantino, swifter than usual to begin with, kicks the second subject into double time, and the extreme speed of the Scherzo's pizzicato sections is accented alongside an especially leisurely trio. A Symphony # 6 ("Pathetique") (Leipzig RSO 1950, Arl 176) generally avoids interpretive rhetoric, perhaps in deference to the work's inherent emotional content. In the Violin Concerto (Leipzig RSO 1951, Arl 64), Abendroth's attempts to soar are largely defeated by the soloist, Rudolf Schulz, who aims for soulful feeling but whose technique is often overwhelmed by the more demanding passages. Kalinnikov – I've always held that the true test of a really great conductor is to make a mediocre work sound like a near-masterpiece. The Kalinnikov Symphony # 1 (Leipzig RSO 1949, Tahra 141-142) presents a formidable challenge but Abendroth proves his mettle, energizing the formulaic sequencing of insipid melodies into a vital, impassioned tour de force. Mozart –We are fortunate to have Abendroth recordings of the Symphonies 33, 35 and 38 and the Serenade in D, KV 286 (Leipzig RSO 1955-6, Arl 163), Symphony # 29 and Divertimento in D, KV 206 (Gewandhaus 1944/8, Arl A07), Symphony # 40 (Leipzig RSO 1952, Arl A07) and Symphony # 39 (Leipzig RSO 1953, Tahra 139/140). All are rendered with historically-informed classical balance, moderation and a lovely attention to nuance and detail. But, typically, Abendroth can't resist an occasional surprise, which in his Mozart takes the form of wildly fast isolated movements – the prestos of the Symphony # 38 and the Divertimento are very presto indeed and the opening allegro of the Symphony # 33 is assai and then some. A Serenata Notturna and Piano Concerto # 26 (Dresden Staatskapelle 1956, Tahra 259) are vivid and stylish, although the sparkling accompaniment in the latter is not fully matched by soloist Stefan Askenase. Haydn – In all four of the symphonies he recorded, Abendroth presents a rather traditional view of Haydn, brightened by bounding dance rhythms, but within a heavily-textured, richly assertive and powerful sonority. 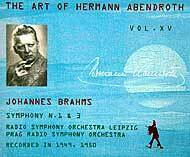 The Symphonies 88 and 97 (Leipzig RSO 1950) and 96 (Gewandhaus 1945) are on Arl 86, while the Symphony # 103 ("Drum Roll") (Leipzig RSO 1951) is on Tahra 139/140. Also noted, but of lesser interest, are a Moussorgsky-Ravel Pictures at an Exhibition (Leipzig RSO 1952, Arl 128), boldly characterized in part but barely distinct from other available versions; a Humperdinck Moorish Rhapsody (Gewandhaus 1949, Arl 128), a dutiful reading of vapid exotic fluff; and a Sibelius Symphony # 2 (Leipzig RSO 1951, Arl 108) whose brisk finale arrives too late to rouse interest in an otherwise deliberate and literal reading. copyright © 1999-2003 Peter Gutmann. All rights reserved.